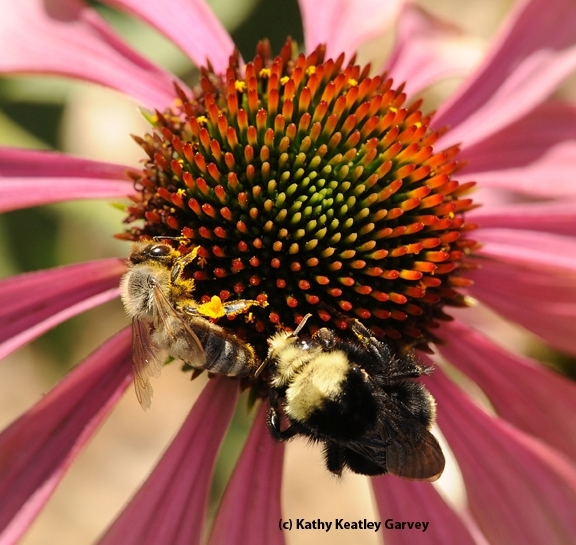 Do Honey Bees Impact the Native Bees? The European honey bee, also known as the Western honey bee, has been in the United States for s-o-o-o long that we think it's a native. It's not. European colonists brought the honey bee (Apis mellifera) to the Jamestown colony (Virginia) in 1622. The native Americans called it "the white man's fly." And the honey bee wasn't even introduced to California until 1853. That was in the middle of the California Gold Rush, 1848-1858, when it arrived in the San Jose area. Our ancestors quickly became quite fond of the industrious little pollinator and honey/wax producer buzzing around them. Today, as they did, we frequently see non-native and native bees sharing nectar resources, such as in the photos below of honey bees and yellow-faced bumble bees (Bombus vosnesenskii). 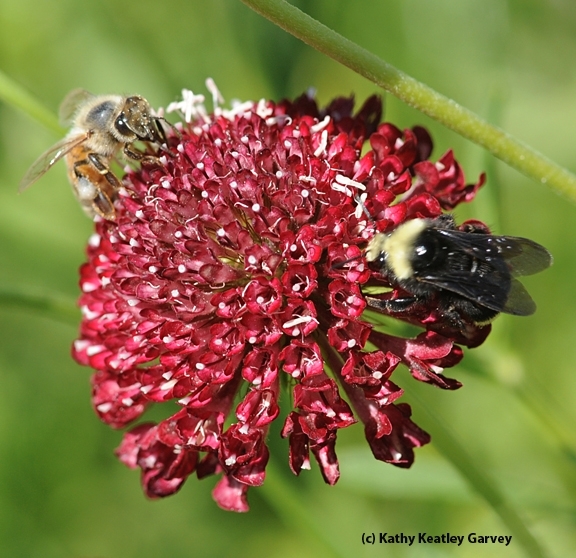 We're often asked: "Do honey bees, being an invasive species, impact the native bees?" We put that question to Extension apiculturist Eric Mussen of the UC Davis Department of Entomology and Nematology. He's served as California's Extension apiculturist since 1976, almost 40 years. His answer: "We do not have a definitive answer to that question. But, since honey bees have been living in what is now the U.S. for just short of 400 years, it is likely that honey bees and native bees determined, long ago, how to partition resources at any particular location so that both species survived. It is true that only honey bees can be moved into and out of a specific location overnight, and that might put a stress on local populations of native bees, but I never have heard of honey bees eliminating native bees from any particular spot." That's the buzz on bees.